After 100+ hours listening to the safehold series it was frustrating to hear the most used words in the novel pronounced differently. I often found myself correcting the narrator. Another slow moving book in the series. Hopefully the next ones better. I've been skipping every other book and found it easy to fill in the gaps of what was missed. Narrator mispronounces many of the names and places. He gets all worked up in parts of the story that do not require it. I love this series and will buy the Ebook to finish it. the previous narrator was quite good, no reason to change. Good luck to you if you can stand him. I’ve been waiting for this installment of the Safehold series. I’ve been holding on to 2 credits for a month! As soon as it popped up I down loaded. 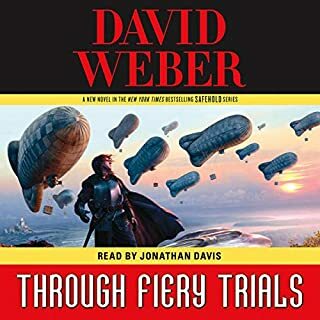 The narrator is energetic, BUT I truly wish that the producers had stayed with the same narrator as the previous installment. If nothing else, the new narrator should listen to the previous story so that the pronunciations of names, places and objects are the same as the previous 5 books. Kevin Collins did not take the time to listen to the previous books in the series. It is obvious from the first 5 minutes that he is not a fan of the series but a guy doing a job. If I had not heard the other 5 books, it would have been an acceptable or better performance. But as I have heard the other books, the performance was avoidable horrible. One other thought, If the producers of this book let this narration out in this condition, what respect do they have to the author or to the consumers of the product? Well if you're a fan of the series, You should get it, but if you compare to previous 5 books, you may notice considerable drop in quality. And the new narrator doesn't help the situation. I agree with other reviewers that the quality of narration is way below that of previous volumes in the series. 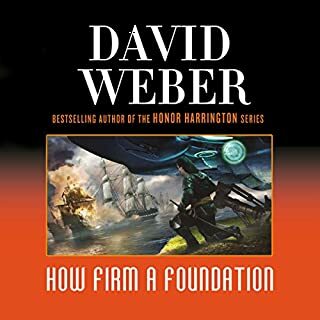 I generally like the story but Weber is way too wordy and his lengthy descriptions impair story flow. You have to be a dedicated Weber fan to wade through these massive books. After six volumes, we seem to have progressed only through 5-6 years of story. As Safehold is still only in the early stages of industrialization, it's going to take a long time for the planet to progress to interstellar capability at the present rate of progress. I know I'm not alone in urging the author to tighten up the stories and move towards a conclusion. I'm older than Weber and would like to see the story concluded sometime during my lifetime and his. The storyline is well done, but I cant help but wonder if we will ever get to the Gbaba at this rate. 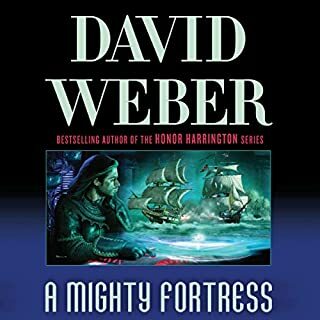 Also the narration was terrible I know many people found the last book less than satisfactory but compared to this fellow the last books was great. It seems he hasn’t gone back over the previous novels and heard how previous narrators have pronounced the various name and place's. Just Read the book. The narrator ruins the story! What did you love best about Midst Toil and Tribulation? I am going to get the ebook as I like the series very much. But I cannot honestly judge this book until I do Read it. Bad Bad Bad narration. Would you be willing to try another one of Kevin T. Collins’s performances? NO! I could not listen for more then 20 minutes. I have deleted the audio files from my computer it was so bad. It was very over emotional, over acted and over the top. Excellent way to ruin a story. As to calling it a performance? Well I guess you have to call it something. The guy is no storyteller! I see that nearly every reviewer has complained about the narrator. I too have complaints about him. It’s bad enough that he didn’t familiarize himself with the pronunciations of names and places in the previous books. But he also mispronounced English words. The most jarring one for me was “demesne”, which is used several times. He pronounced it dih-mez-nay. The correct pronunciation, which anyone can hear for free from Dictionary dot com, is dih-meyn. However, I don’t care to put all the blame on poor Kevin Collins. He should have had a team to help him. 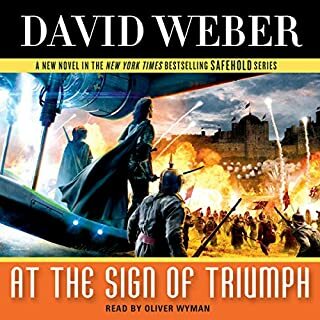 I put more blame on David Weber and Macmillan Audio. 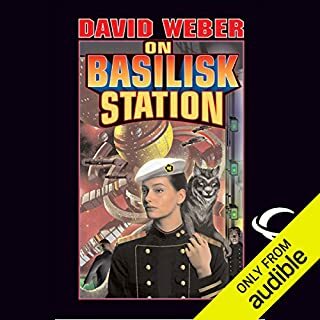 I recently read a blog post by Lois McMaster Bujold in which she mentioned that she had just gotten off the phone with Grover Gardner who narrates her Vorkosigan series books. They talk before each new book so that he knows how she wants things pronounced. Why didn’t Weber/Macmillan do that? It seems like it would be so simple and easy. The fact that they don’t bother to do it, and don’t bother to create some continuity in narrators, seems to indicate that they don’t care about us, the listeners. 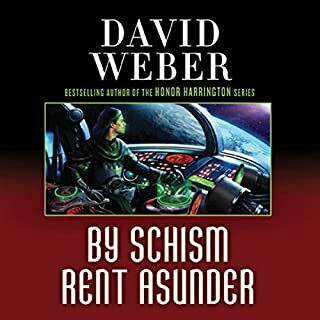 I have another gripe that seems to stem from the same disregard for those of us who purchase our books in either the Kindle or the Audible form: MAPS. In the front of each hard cover copy of the book, there are maps. If you can’t follow the action of the story on a map, much is lost in these books. Events are occurring in many places that are far apart from one another. That is why the maps are there for hard copy readers. But WE are left out in the cold. 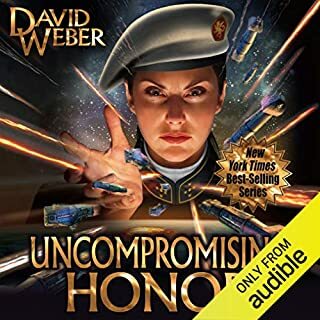 I have seen, on the main page for some Audible books, a notice telling the listener a web address they can access in order to see tables or photos that are in the print book. It seems like it would be so simple for Macmillan or Weber to post the maps for this book online, but they didn’t bother. It makes me angry and sad. Now to the story itself: I don’t know. I felt sort of depressed, angry, repulsed throughout the book. Some of it was because of the map thing and the narrator thing. But some of it was from all the torture and hatred. 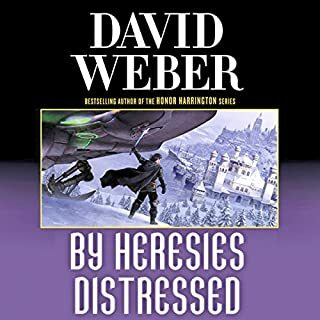 At least Weber didn’t go into the details of the torture in this book like he did in the last one, but it gets mentioned on practically every third page. All that hate just didn’t make for a fun read. And some of it was a sense of hopelessness that this story will ever go anywhere and accomplish anything. 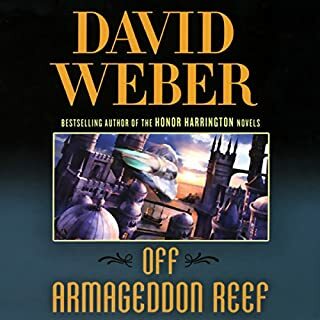 As I finished the first book, I naively expected the second book in the series to take place some hundreds of years in the future after the changes Merlin had set into motion had time to mature and change the society. But no, each book seems to give us the events of a single year, and still it seems that it will take hundreds of years for the necessary changes to take place. 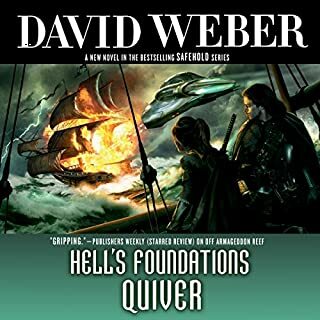 I won’t be around for hundreds of books in this series, and neither will Mr. Weber. Will his descendants hire ghost writers to finish the series for him? If so, I won’t be reading them. Well, I’ve got to stop. If you have read and liked the previous books in this series, you probably want to read this one too. Just don’t get your hopes up too much. A horrible narrator for a good book. I thought the narrator for How Firm A Foundation (Charles Keeting) was a poor choice but by comparison to Mr. Collins, Mr. Keeting turned in a virtuiso performance. How I wish I had listened to the preview before waisting a credit on this HORRIBLE revording. 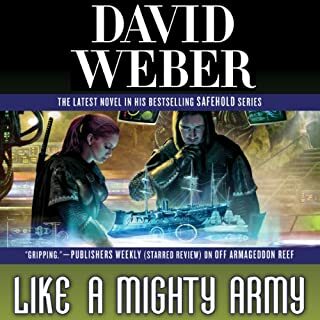 I have listened to and enjoyed all the other Safehold books but this will be the last. 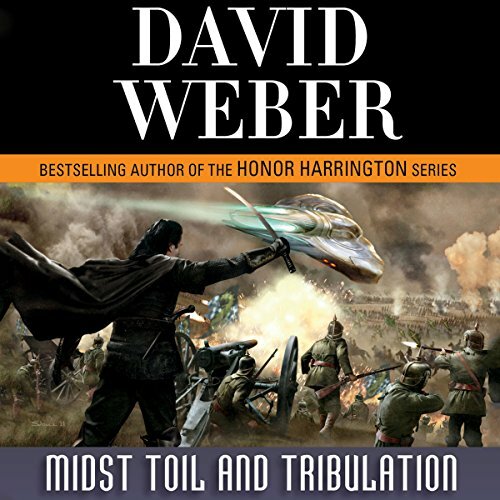 I will stick strictly to print fot the remainder of the books Mr. Weber writes in this series. The performance is so poor that I am sorry to say that I can only give this 1 star overall. The performance simply runis a wonderful book. What made the experience of listening to Midst Toil and Tribulation the most enjoyable? My enjoyment of this book was marred by the narration, Mr. Collins obviously did not bother to listen to any of the previous books in the series and as a result pronounced both place names and proper names differently than the previous narrators. This introduced a repeated jarring note into the narration. An example is the name Nimue. I have always heard it pronounced Ni-mue, Mr. Collins read it as Nim-u-e, I don't know which is correct, but in the previous 5 books of the series and in the books on Arthur that I have listened to it has always been pronounced Ni-mue. This is just one of the many pronunciations that was changed. Would you listen to another book narrated by Kevin T. Collins? No, unless it was unavoidable. If Mr. Collins is picking up a series that has already started I strongly suggest that he listen to the previous books in that series or at least ask the author for the preferred pronunciation. A bit of research prior to narrating maybe!? Can we PLEASE bring back Oliver Wyman now?! Would you be willing to try another one of Kevin T. Collins?? ?s performances? Not unless he is the only reader in a series. He obviously didn't bother to listen to previous books to pick up consistent pronunciation and accents.